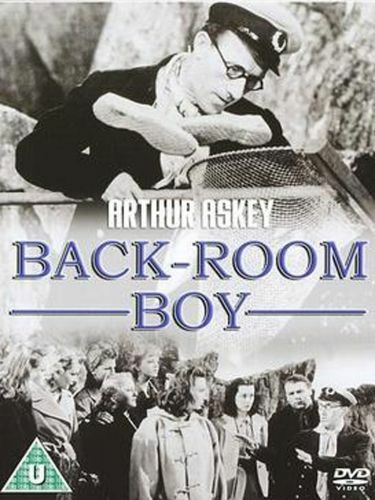 British radio funster Arthur Askey inherits British film comedian Will Hay's longtime stooges Moore Marriot and Graham Moffatt in Back Room Boy. Big-Hearted Askey plays a cuckoo scientist seeking peace and quiet in a Scottish lighthouse. No such luck: the house is being used as a rendezvous for Nazi spies. Beyond the presence of Marriot and Moffatt, one gets the impression that Back Room Boy was originally intended as a Will Hay vehicle, inasmuch as Hay's longtime scripters Val Guest and Marriot Edgar wrote the yarn. Young Googie Withers fares well in an a thankless leading-lady assignment.